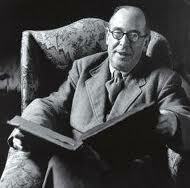 Meditations with C. S. Lewis: Narnia, rightly! I think I agree with your order for reading the books [the chronological one] more than with your mother’s [who thought the published order was intentional]. The series was not planned beforehand as she thinks. When I wrote The Lion I did not know I was going to write any more. Then I wrote P. Caspian as a sequel and still didn’t think there would be any more, and when I had done The Voyage I felt quite sure it would be the last. So perhaps it does not matter very much in which order anyone reads them. I’m not even sure that all the others were written in the same order in which they were published. I never keep notes on that sort of thing and never remember dates. In the end, readers will likely glean something from either approach. It is far easier to get a real sense of the growth and history of Narnia if we read chronologically, but also, perhaps, a unique insight into Lewis’s own mind and life to read them in the order they were published.